… To put it simple – legs and hips will get a active partner from arms and upper body muscles for walking action. 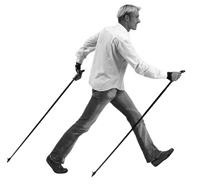 This tiny detail – to add the upper body muscles to support walking action and to make it more comprehensive and effective total body workout – increases Nordic walking training effect within 40% when compare it to walking without the poles. In a practise the meaning is enormous for the people who are looking for effective but easy going exercise form for them. There is no need to add the speed of walking – but with a pair of poles in hands one will get a lot more comprehensive exercise to improve the fitness of respiratory-, cardio vascular system and a muscle conditition – All in during one exercise.